In Odhiambo’s debut novel, a young girl faces a difficult decision when AIDS hits her Kenyan village. Born “facedown,” 13-year-old Auma knows she’s destined for great things. As one of the fastest runners in school, track is her ticket to getting a scholarship to continue her education. But in her village of Koromo, people are dying at an alarming rate from a disease called AIDS, and few people really know why. Auma’s dream is to become a doctor and help those afflicted. When first her father becomes ill and then her mother soon after, Auma is left shouldering the responsibility of caring for her family. 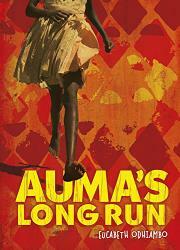 Grades and running begin to take a back seat to feeding her family, and Auma must find the strength to follow her dreams, no matter how impossible they seem. In Auma, Odhiambo draws from her own experiences of growing up in Kenya during the beginning of the AIDS crisis to present a strong, intelligent protagonist who questions and refuses to give in to what is normally accepted. Auma treats readers to beautiful descriptions of the world around her but also gives them a candid look at the fear and superstition surrounding AIDs in its early days in Kenya as well as the grief of loss. All of the characters are black.